MISSION, KS--(Marketwire - Sep 6, 2012) - (Family Features) Lectures and scare tactics by well-meaning adults have not yet transformed this nation's teen drivers. According to the National Highway Traffic Safety Administration, car crashes remain the leading cause of death for teenagers in America. Thankfully, students -- the people best positioned to make change -- are taking note and taking a stand against this startling statistic. Mallory Keller, a student at Belton High School in Belton, Mo., explains: "Teenagers do not listen to safety messages from their parents as well as they do when those messages come from their friends. It is easier to relate to advice from fellow teens." Through participation in a high school grant program called Project Ignition, thousands of students like Keller have positively influenced the driving behaviors of their peers and broader communities throughout the U.S. and Canada. Designate a texter and hand over your phone. Or, better yet, turn your phone to silent and lock it in the glove compartment until you arrive safely at your destination. Connect with your parents on ground rules for driving. Know what the consequences will be if the rules aren't followed. Prepare a driving playlist. Don't let your driving be distracted while trying to find the perfect song. Use your head. Remember that there is absolutely no text, song, call or distraction that is more important than your life or the lives of others. Drive defensively by keeping your full focus on the road and other drivers so you can react to changing situations. Be prepared with a strong, clear statement to stand up to a peer who isn't driving safely. Something like, "We both want to live, so let me answer your phone or text while you focus on driving." Find out what is actually happening in your community and who your partners are in making roads safer for teens. Know and support effective laws in your state, such as graduated drivers licensing. Grab some friends and get involved with a program such as Project Ignition to gain valuable academic and leadership skills while saving lives on the road. Project Ignition, coordinated by the National Youth Leadership Council® and funded by State Farm®, provides grants to public high schools in the U.S. and parts of Canada. This service-learning program provides schools and students with the opportunity to address teen driver safety issues in their communities. Now through November 15, apply for a grant. 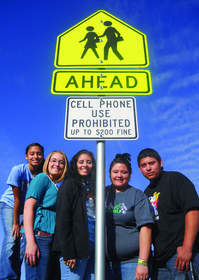 In January 2013, 25 schools will be chosen to receive $2,000 grants to support the implementation of teen driver safety awareness and engagement campaigns. In May 2013, the 10 best campaigns will be selected to receive an additional $7,500 to continue their project in the following school year and participate in the National Service-Learning Conference in 2014 in Washington, D.C.
Additional information and the grant application can be found at www.sfprojectignition.com. Get connected at www.facebook.com/projectignition. Project Ignition students are taking a stand to save lives on the road. Ready to join them?